With 1979 Marv Wolfman created the first "epic" of the title, an 11-issue oddysey that took in Galactus, the Skrulls, the near-death of the Fantastic Four and the creation of Terrax. The concept of it becoming the title's then-longest story wasn't actually intentional; Marv Wolfman had intended for much of the story to be played out in the pages of The Man Called Nova, but when that title was cancelled after Issue #25 (the same month that #206 came out), the rest of his tale got brought over to The Fantastic Four. The final issues of the saga really pay off, with Wolfman's creation The Sphinx being taunted by the vision of his own fate, relayed by the faceless character Sayge, and engaging in a battle with Galactus where he is forced to relieve his life throughout eternity. High stakes are present through the run, as Reed, Sue and Ben are blasted with a Skrull ageing ray that sees them on the point of death, and Johnny has to fight against the odds to save them, while the fate of the entire world hangs in the balance. Sadly, it's not all quite this good. While the Galactus-Sphinx battle pays off, it's a little demeaning to see a creature who stands above morality resorting to a fist fight. Muhammad Ali had announced his retirement in July 1979, but very few readers would have expected Galactus to have been trying to take his place just five months later. And while Marv's dialogue is often considered and literate, he does have a tendency to drop in pure comic book dialogue like "dung dogs", "creepo" and "bozo-breath". The weakest of the year is #209, an issue that serves as pure padding and doesn't advance the plot, but ultimately the final payoff justifies the run and makes it seem like the universe-spanning epic it is at heart, rather than a story with a strong ending but a somewhat flabby, unfocussed beginning. The covers for the year are particularly scrappy, but the art within is improved with the cleaner layouts of John Byrne, working to the "house style". Keith Pollard leaves during the start of the year, and both Buscema brothers get an issue each, then it's left to John to see in the 80s. 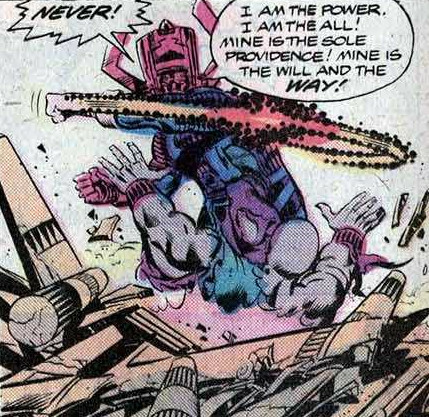 In terms of trivia, then it never seems to occur to Reed to ask an unusually egotistical Galactus if he'll reverse the ageing ray for them, and the FF spare very little soul-searching over their decision to obtain a new Herald for Galactus, and in so doing entrap another being into a lifetime of servitude. (Ben does reason that Terrax was a slave trader, but they didn't know that when they first agreed to enlist him). Cartoons actually get to play a part in the book, with the DePatie-Freleng effort (which finished airing in September 1979) seeing HERBIE introduced to the title, with a more sinister edge to the character, as well as acknowledgement that the characters know there's a cartoon series about them. A week after the cartoon finished airing, NBC followed up with another FF-related cartoon, Fred and Barney Meet The Thing, which was announced by Stan in one of his Soapbox columns and is, along with all the Fantastic Four cartoons, reviewed in the Media section of this site. On the subject of trivia, then the May issue of 1979 saw a price rise. From just its third issue the Fantastic Four got a rise from 10 to 12c. This continued for many years until #89, which saw a second rise to 15c. With the extra-length #116 going up to 25c, it dropped to 20c from #117, a price that it maintained until May 1974 (#146) where the 25c price was again reached. #174 marked the 30c tag, while #188 added another 5c to the cost. #200 was a 60c double-length special and the aforementioned May issue of this year marked the seventh price rise… not bad for seventeen years. Sadly, it would be the September of the following year which would see it bumped up to the 50c mark. For trivia within the fiction of the magazine, then the January issue reveals that Reed has attached the top five floors of the Baxter Building to the rest of it with magnetic couplings. This way it can be detached if there’s a threatening danger, so as to appease comedy landlord Collins, who was last seen raging at the group just the previous issue. If it can be detached, where does the electricity come from? Also look out for Spider-Man getting his camera smashed (#207) but still somehow using photographs to resolve the plot. Equally inexplicable is Johnny telling Reed that Sue aged quicker because they came from a family who died young, including their parents. Marv had a long memory when it came to the title (one of Stan and Jack's weaker creations, The Monocle, gets a return appearance in this run), but did Marv forget Issue #32, where their mother was revealed to have been killed in a car crash, and their aged father was killed by the Skrulls? Outside of the storylines of the regular issues, then the fourteenth Fantastic Four annual is an unusual proposition. Included in 1979's line-up as it contains a December 1979 cover date, there's nevertheless nowhere for it to fit into the '79 narrative, and Ben even references the recent conclusion of events in #215 (February 1980). An inconsequential issue, co-plotted and pencilled by George Perez, it sees his work somewhat buried under the inks of Pablos Marcos. 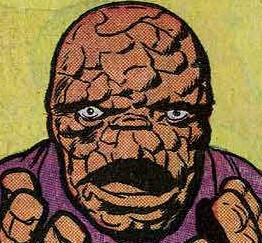 The annual is significant in that it reawakens Franklin's latent powers, less significant in that it reveals Ben once had a "kitty" called Muffin, and quite sad in that it triples the power of Salem's Seven member Bruticus, thus adding him to the ever-increasing list of Marvel characters who were by this stage stronger than the Thing. The tale is a fun but skippable read, and unfortunately removes a lot of poignancy from the first Richard Scratch story by having him return. Len Wein, the creator of Scratch, wasn't concerned with the character returning at the hands of another writer, stating in an interview with this site that "I think every story stands on its own. God knows I've brought enough of other people's characters back from the dead over the years." Lastly, while America and England are essentially countries with the same tongue, there are some minor divergences in language that can amuse. For example, Ben calling someone a “bum" to mean tramp would cause slight amusement when read in the UK where the same word is another word for the derrière. John Byrne (who should know better, being born in England himself) would later pull a similar trick in FF #279 with a story entitled “Crack Of Doom". Future issues would see Ben describe the group as “fannies", which, while being along the same lines for its home market, would mean a very different part of the anatomy when read overseas in the UK. 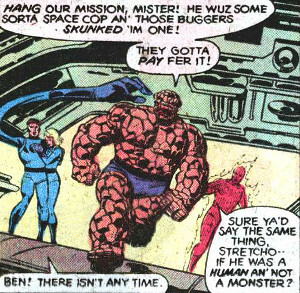 All of which brings us to the trivia of Ben using the word "bugger" several times throughout these issues, which is a term for sodomise in England. For amusement I asked Marv himself about it, who replied “Here it doesn't mean anything bad. It sort of means jerk. And not even that harsh. So no, I didn't intend it." Many issues of other titles are name-checked in this run: Avengers #181, The Amazing Spider-Man #21, #27, #193 and #290 and The Man Called Nova #1 are all issues that are referred to but inessential in order to appreciate the title. However, The Man Called Nova #25 is necessary for events that occur in the year, and Marvel Team-Up #22 is arguably a necessity as it gives the pre-story towards Quasimodo's appearance in FF #202. There are also external characters with Nova who, while their essential purpose can be gleaned, don't get a full introduction in the pages of The Fantastic Four. The Man Called Nova introduces many of these characters in its pages, such as Condor (#2), Diamondhead (#3) the Sphinx (#6) and Comet (#22). Meanwhile, Doctor Sun first appeared in The Tomb of Dracula #16, which puts the FF in canon with Marvel's 70s line of horror comics. A far older character, but one fairly obscure, is Sayge, created way back in 1967 in Strange Tales #154.